I again had some fun this year playing KoreLogic's Crack Me If You Can password cracking contest at DEFCON 21. 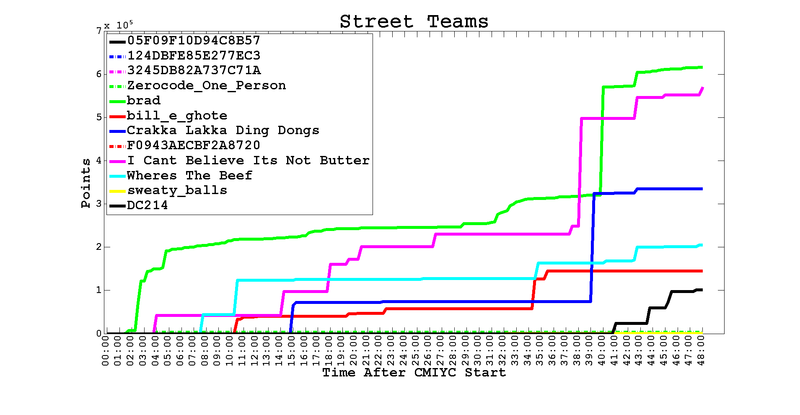 This year they separated teams between "Pros" and "Street" to make things a little more fair for individual users vs large groups. If you have any interest in password cracking then you can still download all the past 4 years of data and crack away! Huge thanks to the KoreLogic guys for putting on an excellent contest! New to the contest this year, password hash files were grouped into companies with each company having their own password policy. The description of the policies were given as hints within the Challenge files which may have their own complex password requirements. It was truly inventive and really gave the contest a real-world feel to it. Even so I came in third place mostly because I spent a little extra time on Challenge 9 because of the point value - 250,000 points! In order to mount the file you need to skip the first 65536 bytes (1 cylinder) to get to the partition data. With the filesystem mounted lets check out what's in there! Success! Only took about 4 hours thanks to a weak password! Now we just have to figure out how to pull the files off, import the PFX into Windows... etc. etc.. Windows.. pffft.